#FREEBASSEL Campaign ~ Please spread the word! The #FREEBASSEL campaign launched today by releasing a letter signed by leading supporters and organizations that Bassel has worked with for some time including support from Joi Ito, Chaiman of the Board for Creative Commons, Lawrence Lessig, Harvard Law School Professor, Jimmy Wales, and already 577 others from around the world who have signed a letter of support to #FREEBASSEL. The letter is directed at the Syrian Government, people living in Syria, Internet citizens and related diplomats worldwide with the goal to raise awareness about Bassel’s situation to see him free once more. Since then, Bassel has become known worldwide for his strong commitment to the open web, teaching others about technology, and contributing his experience freely to help the world. Bassel is the project leader for an open source web software called Aiki Framework. He is well known in online technical communities as a dedicated volunteer to major Internet projects like Creative Commons (www.creativecommons.org), Mozilla Firefox (www.mozilla.org), Wikipedia (www.wikipedia.org), Open Clip Art Library (www.openclipart.org), Fabricatorz (www.fabricatorz.com), and Sharism (www.sharism.org). 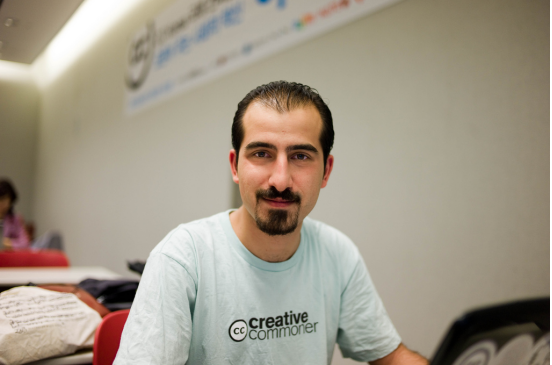 Since his arrest, Bassel’s valuable volunteer work, both in Syria and around the world, has been stopped. His absence has been painful for the communities that depend on him. In addition, his family, and his fiancée whom he was due to marry this past April, have had their lives put on hold. ● Please use the #freebassel hashtag in social media. ● Image of Bassel: http://www.flickr.com/photos/joi/4670781482/sizes/l/in/photostream/ by Joi Ito (Creative Commons Attribution 3.0 licensed). ● Syria: Torture Centers Revealed. Human Rights Watch. http://www.hrw.org/news/2012/07/03/syria-torture-centers-revealed. Accessed 3 July 2012. ● Torture Archipelago: Arbitrary Arrests, Torture, and Enforced Disappearances in Syria’s Underground Prisons since March 2011. http://www.hrw.org/reports/2012/07/03/torture-archipelago-0. Accessed 3 July 2012.